We’re having a BIG family night on December 20th! It is very important for folks to RSVP with number and ages of children, since there will be a special guest and gifts for all! 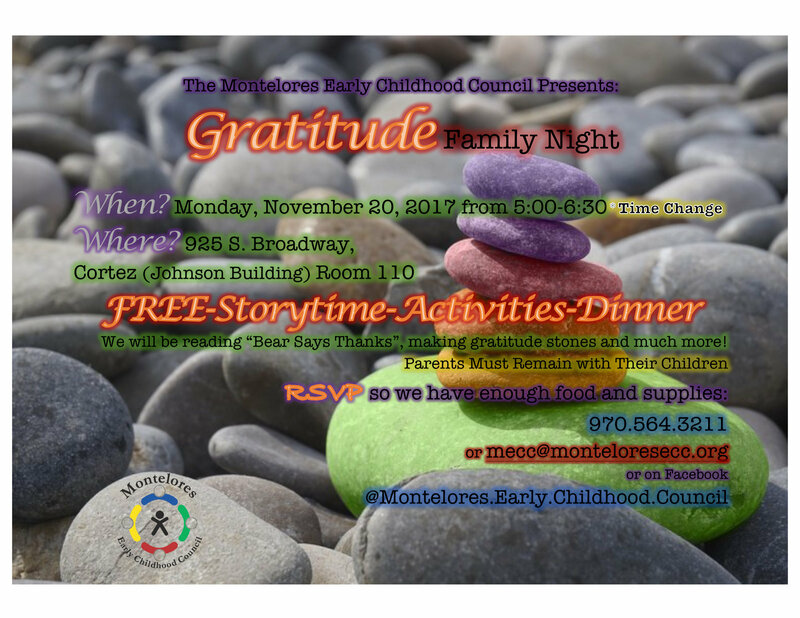 RSVP to our Facebook page, or contact Adriene at (970) 564-3211 or adrienr@monteloresecc.org. Gobble gobble! 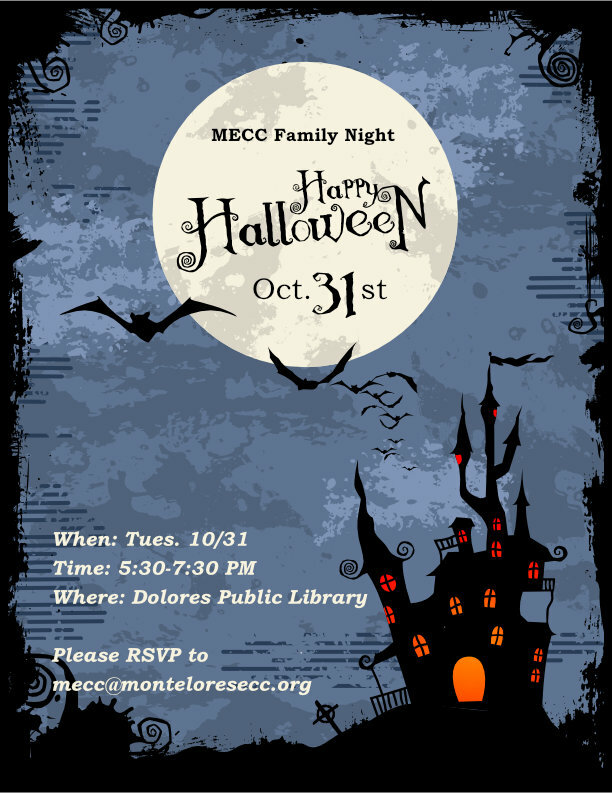 MECC will be hosting a daytime family event on November 20th with crafts, family photos, food, and more … all FREE! Please RSVP to (970) 564-3211 or adrienr@monteloresecc.org so that we have enough food and supplies for everyone. Hope to see you there! Hello and Happy New Year! 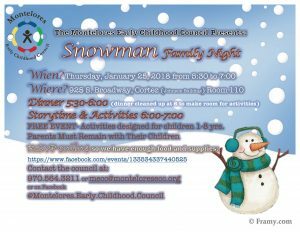 MECC’s first family night of 2018 promises to be snow much fun!! See the flyer for more details. We are trying an online RSVP through Facebook Events – give it a try – if that doesn’t work for you, feel free to call or email your response. Regardless, please do RSVP so we have enough food and supplies for everyone! 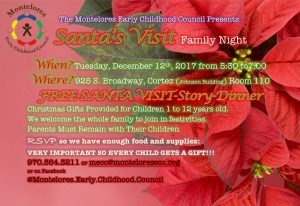 Please see the attached flyer for info about our family night next week with Santa in attendance. Please do RSVP so we have a good count for gifts. 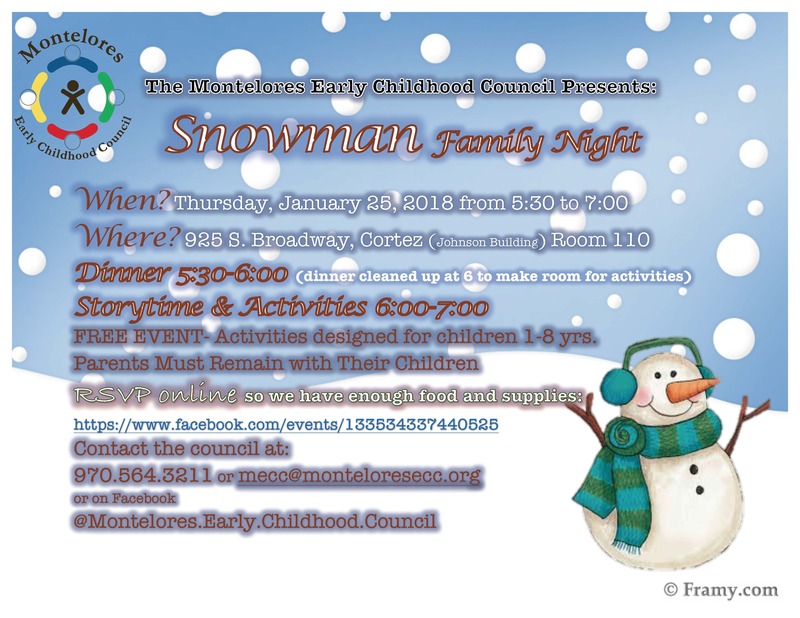 This month’s family night is earlier than usual – please note the time change. 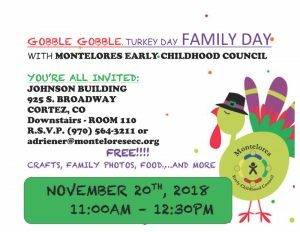 We are going to be doing activities that could become family Thanksgiving traditions 🙂 As always, please let us know you are coming so we have plenty of food and supplies. Our next family night will be a bit different this month. 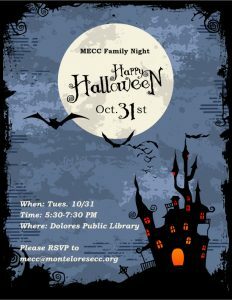 It will be held Halloween Night at the Dolores Public Library, Tuesday, October 31st 5:30-7pm. 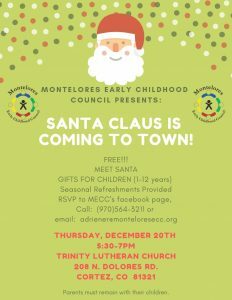 Please RSVP to mecc@monteloresecc.org.